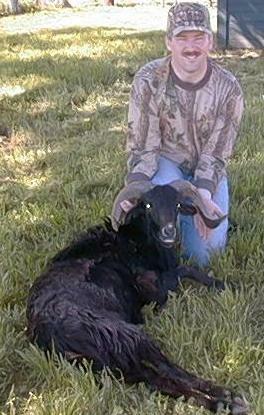 This Hunt is for a $300 class Black Hawaiian Ram. We have Black Hawaiian Rams for $300, $700, $1500, and up. You may upgrade while hunting for additional fees. These sheep are black in color and sometimes have an outer coat of reddish wool. They will frequently have a white muzzle. The horns are usually dark. They grow up, back, down, forward, up, and out. A large male can weigh 140 pounds and a female will weigh about 75 pounds. There are fewer Black Hawaiian Rams than the other sheep species. They can have a thick, nice beard on their neck. Sailors put these sheep off in the Hawaiian Islands so they could have fresh meat when they returned. This hunt includes lodging for 1 night, guide and use of a walk-in-cooler. There are no additional Trophy fees or additional Kill fees. The only extra charge is $25.00 for the guide to skin, gut, and cape your Ram. If you do it yourself then there is no charge. Most hunts will take one day per animal. Hunter only pays for the game they shoot. Our guides spend hours in the woods and hills looking for game before you come hunting. Tips for guides are welcome and greatly appreciated.. Lodging is included in the price of your hunt. Food is not provided. You will need to bring your own food and beverages (Kitchen and Bar-B-Que pits are available), or take advantage of our local nearby restaurants. Skinning, quartering, and capping of game is available. If you are going to take the meat home, be sure to bring extra coolers. Processing available on request as well as a walk-in cooler. If you don't want the meat, we donate it to the needy. The sizes of rams will vary. There will be rams larger and smaller than pictured.